And the moon smiling upon me! 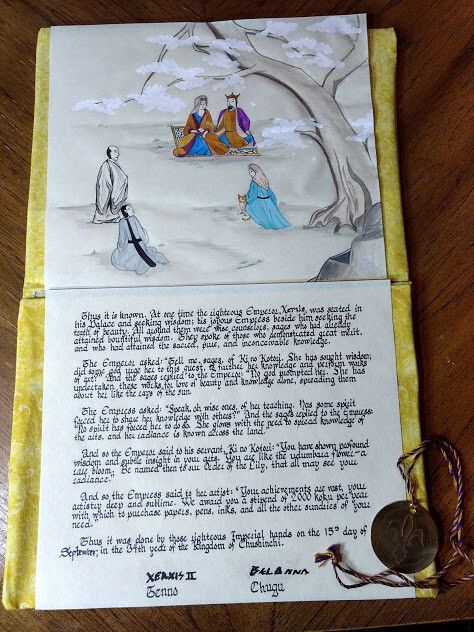 At the Queen’s Prize Tournament last Saturday, Their Royal Majesties Xerxis II and Belanna graciously invited me to join their Order of the Calon Lily, which is Calontir’s Grant of Arms Arts award (and a polling order). I’m sure pictures of me being completely gobsmacked by the whole thing will be turning up on the interwebs soon enough. As it happens, I wasn’t wearing Japanese garb that day–I was in my Norse boyclothes (stolen from my husband), because I’ve lost so much weight that I need to make new clothes! It has been 15 years since I’ve received an award, so I definitely was not expecting it. Anyway, still processing the whole thing. I’ll be making a post later about Queen’s Prize and sharing my own entry–the Kotori no Uta Hyakushu (100-linked-poem collection) soon.